R.U. Seriousing Me? : America's Most Efficient City Is... Miami? America's Most Efficient City Is... Miami? DC may be tops when it comes to green roofs, but the region stands out less on a more impactful environmental indicator: how efficiently our infrastructure is laid out. The purpose of infrastructure is to connect people, goods, information, and services. When people live close together, less infrastructure is needed to make these connections. Consider one type of infrastructure, perhaps the most representative from an urban planning perspective: roads. Roads cost money to build and maintain. Movement along those roads creates pollution and costs the users time. All else equal, it is more efficient to build, use, and maintain fewer roads per person. Which of the 12 statistical areas in the United States with more than 5 million inhabitants has the greatest number of people per mile of arterial roads? That honor goes to the Miami Metropolitan Area, perhaps not by choice but rather by geographic necessity, tightly bound by ocean to the east and the Everglades to the west. 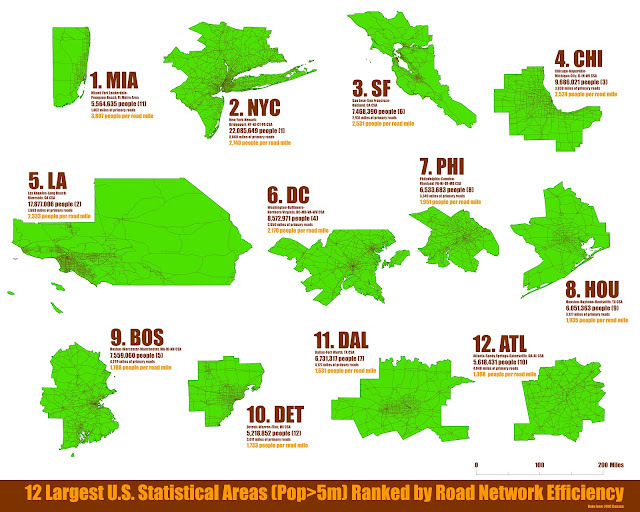 In contrast, the Atlanta Combined Statistical Area (CSA), the most sprawling of the 12 regions, has roughly the same population as Miami, but its roads total a distance nearly 3 times as long. Wouldn't it be great if we could spend all the money that goes to maintaining those unnecessary miles of road on something more productive? The DC-Baltimore-Northern Virginia CSA ranks right in the middle, at number six, just behind Los Angeles, a fact that local environmentalists probably won't find especially comforting. At least we have both Houston and Dallas beat. Miami is the only one of the largest metro areas not to have multiple Metropolitan Statistical Areas making up one larger CSA. Does that account for the change? No; even if you look at the individual Metropolitan and Micropolitan Statistical Areas that make up those 11 CSAs, Miami's still has the most people per road mile. The gap between the Miami metro area and the second place, New York-Northern New Jersey-Long Island, NY-NJ-PA, is closer, and without Ventura County and the Inland Empire, the Los Angeles-Long Beach-Santa Ana, CA metro area jumps to #3, but otherwise little changes in the calculation.